Punjab Higher Education Minister Surjit Singh Rakhra today gave stern message to officers/officials of the department to all pro student schemes of well in time otherwise they will have to face the flak. He also directed immediate release of grant in aid to private aided colleges.Chairing a high level meeting of higher education Rakhra directed all institution heads would ensure submission of monthly status report of all projects to him and no laxity or delay in this regard would be tolerated. “It is time to perform besides improving functioning and speedy execution of ongoing projects to uplift the standards of higher education in the state otherwise the non-performers will have to face the music,” he asserted. Taking serious note of lax approach of some colleges towards UGC offered schemes and National Assessment and Accreditation Council (NAAC), Mr. Rakhra asked that such attitude was not be acceptable. He said the officers of DPI Office would look into such cases by directly intervening into these issues to maintain the flawless execution of UGC sponsored schemes. He said that headquarter will inpidually have a close tab in such cases. He also stressed that to uplift the standard of education in colleges grading of colleges should also be made by NAAC. Dr. Roshan Sankaria, Principal Secretary Higher Education apprised Minister that department has taken several infrastructure reforms, which were in full swung. He said that Chief Minister Mr. Parkash Singh Badal had sanctioned Rs. 50 crore for infrastructure building in higher education institutions out of which Rs. 29 crore has been released. He said 80 percent infrastructure works have been completed while the remaining works were also in advanced stage of completion.On the issue of 95 percent deficit grant to Private Aided Colleges of state, Mr. Rakhra directed Principal Secretary Higher Education to expedite the process and fulfill all required conditions. He said that for the 2014-15 session grants should be released immediately without any delay. Mr. Rakhra also gave nod for setting up of 13 Finishing Schools in Government Colleges. Project Director RUSA informed the minister that RUSA will release all pending grants for the early formation of these schools. It was also informed in the meeting that there were several skill development courses operational in community colleges including government Mahindra College Patiala and Government College Ludhiana. The Minister also asked the department to increase the ambit of these colleges to increase the interests of unemployed youth towards skill development. He also advocated that these skill development courses should be started in remaining colleges too. Issuing strict directions to implement Scholarship program for SC/BC and needy students, Rakhra asked officers to immediate release scholarship amounts in coordination with all concerned authorities. He said there would be no delay and harassment of students in disbursement of scholarships. The issue of providing books to all libraries in the state by Raja Ram Mohan Rai Foundation Kolkata was also discussed.Dr. Roshan Sunkaria, Principal Secretary Higher Education, Mr. J.S. Ghuman, DPI Colleges, Mr. T.K. 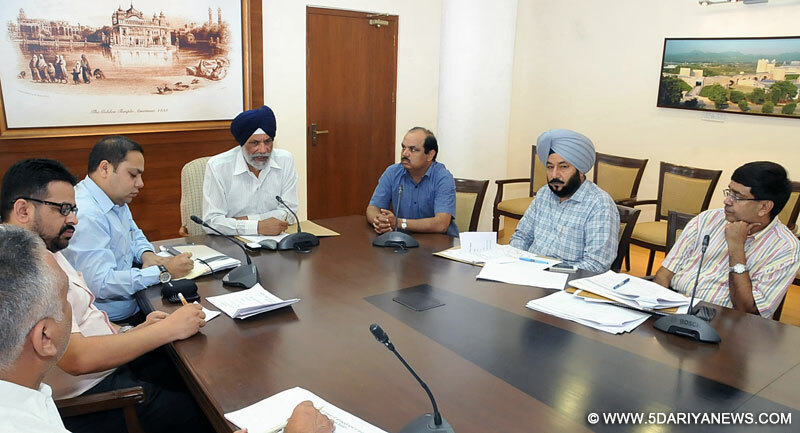 Goyal, Project Director RUSA, Mr. Jagdeep Singh Deputy Director, Additional Director of RUSA Mr. Gurdarshan Singh Brar and all officers/officials of DPI Colleges were present in the meeting.